Welcome to another Expanded Universe column where I feature essays from authors and editors of fiction, poetry, and non-fiction, as well as from established readers and reviewers. My guest today is Carolyn Ives Gilman, who is a Nebula and Hugo Award–nominated writer and real-life historian at the Smithsonian’s National Museum of the American Indian. 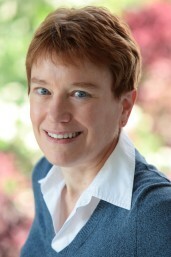 Her novels include Halfway Human and the two-volume novel Isles of the Forsaken and Ison of the Isles. Her short fiction appears in many Best of the Year collections and has been translated into seven languages. In her latest work, Dark Orbit, on sale July 14, 2015, she imagines a strange and compelling new world. Exploration Blues: Is Discovery Possible? Science fiction has a long history of tales about exploration. You could argue that SF’s lineage traces back to the travel narratives of the 16th through 18th centuries, when Europeans were discovering wonders all around the globe, and the people back home were snapping up books about them. When terrestrial wonders ran out, we had to go elsewhere in our imaginations. I started to think seriously about discovery when, in my day job as a museum curator, I was organizing the Lewis and Clark Bicentennial Exhibition. As I read their journals, I couldn’t help but notice how much Lewis and Clark got wrong, and why. They were fine when observing mountains, rivers, and grizzly bears. These were known categories. It was when they started to observe people that they lost their way. They had gone west with certain expectations about the people, and no matter what they actually observed, they reached conclusions that reinforced their existing ideas. You want an example? Before the explorers set out, Thomas Jefferson, Lewis’s mentor, wrote that Indian women were oppressed. He knew this not because of any observations of Indian gender relations, but because it fit the prevailing theory of social development. (They didn’t yet use the word “evolution,” but that was what they meant.) In primitive societies, so the theory went, women were little more than chattel, beasts of burden, dominated by the men. Indians were primitive, ergo Indian women were oppressed. What Lewis and Clark actually recorded was a wide variety of gender roles. Among the Clatsop on the west coast, they wrote disapprovingly of how much power the women had, and how meek the men were in the presence of high-born female authorities. But this never caused them to revise their conclusion that Indian women were oppressed. Historians have believed them ever since, despite the protests of actual Indian women. If explorers could go so wrong here on Earth, where we’re all of the same species, how much harder will it be when we go to other planets and encounter things that have no precedent in our experience? How will we make sense of things so alien to us that they are outside the realm that our brains and senses evolved to observe? And so I sent an exploring party to a very strange planet to find out. My latest novel, Dark Orbit, is a kind of thought experiment about how we would attempt to tame the incomprehensible. My explorers are a varied crew—from an irreverent, outspoken ethnologist to a mystical, introspective philosopher—but most of them are scientists. They are not prone to stupid mistakes, but they have many of the same assumptions we do. On the planet Iris, they are pitted against an alien biota that has adapted to an environment where space is not stable, but apt to crinkle up into five-dimensional folds, and where paradox clusters blow through, playing havoc with reality. In a forest on Iris, visual evidence is almost useless, since the explorers are surrounded by reflections and light-echoes that distort all they see. Small wonder that the group of native humans they find living on Iris are blind. Sight is actually a disadvantage when seeking to understand this environment. And yet, like Lewis and Clark, the scientists try to fit what they see into known categories. It is as if, looking at the visual paradox that can be seen as either a vase or two faces, they all reach a consensus on which one is right. This impulse is fundamental to science: reaching definitions, classifying and categorizing. My point in Dark Orbit is that, in a truly alien environment, the techniques of science might obscure as much as they clarify. In fact, the larger question is whether the methods of discovery we adopted in the 16th through 18th centuries, and still use today, might not be obscuring important things about reality right here on Earth. Our brains and senses evolved to assure our survival, and so they edit out much of the stimuli that don’t have a direct bearing on waking up tomorrow morning. We are very good at sensing grizzly bears, but sometimes our brains are not so hot at women and other imponderables. Like Renaissance explorers, the Iris expedition is forced to make profound discoveries about themselves. When their very survival comes to depend on making sense of things outside the usual repertoire of our brains and senses, they have to rely on the skills of the mad and the blind, and ideas that profoundly challenge scientific orthodoxy. They have to question the way we all construct and organize reality in the lumps of neural matter that are our brains. So, is discovery possible? My answer in Dark Orbit is yes, but it may not look at all like the discovery we are accustomed to. Thanks, Carolyn! Readers, tell us about your favorite stories of discovery. Discuss in the comments. 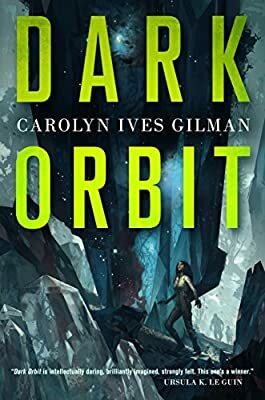 One commenter will receive one copy of Gilman’s Dark Orbit. I’d have to go with The Lady Trent series. Particularly the second book, The Tropic of Serpents. “Surface Tension” by James Blish, about microscopic genetically engineered humanoids who evolve in a puddle on a far away planet, and try to explore beyond their known world. “We are very good at sensing grizzly bears, but sometimes our brains are not so hot at women and other imponderables.” Brilliant! A DARKLING SEA by James L. Cambias deals with some of the issues of “disovery.” One of the exploring races is native to the planet; it’s not just the humans who are on a quest of discovery. Dark Orbit sounds like my kind of book. Two favorites are Sharon Lynn Fisher’s Ghost Planet and Echo 8 – the discoveries are not what you would expect, but very interesting in my opinion. Ray Kolb, if you live in the USA, you win a copy of Dark Orbit!